Yesterday, was day one back at work. So not much quilting happening. I have made some progress on my nine patch & stripes. The nine patches are coming along quite nicely. I have to have 44 for each quilt. I have finished two knitting projects. 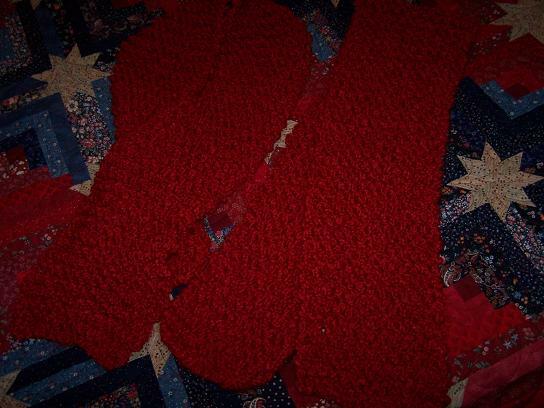 Matching scarves for my friend & I to wear to our sons’ golf tournaments. Nothing fancy and neither is perfect. I gave my friend hers yesterday, and she seemed to really like it. Two other friends from work have already indicated that they wants scarves, too. Good thing that’s all they are asking for, as I have trouble understanding knitting patterns, and may never graduate from scarves…lol. 🙂 Maybe the knitting DVD I ordered will be helpful. The scarves look great Randi, but the starry nine patch underneath them is awesome. If you have seen my blog you know I am doing the nine patch and stripes too but I didn’t get to work on mine yesterday. Maybe today. Have a great day. LOL Judy! I know there are only two stitches, but all the different crazy combinations, and changing colors, dropping stitches, adding stitches, blah, blah, blah…it boggles my feeble mind! Freda, I will have to pop over to your blog to see that! 🙂 I don’t knit at all so I am in awe of any one who does 🙂 Great job on exercise. Can you do some for me too?! Are you still using the inversion table with success? Great scarves – I have a bunch of yarn in the closet that I bought last year to take up knitting after MANY years away from it. I made a poncho, but that was all. I do understand wanting something to do at night. Maybe you’ve inspired me to get it back out. Wait, you mean were’ SUPPOSED to knit with DIFFERENT COLORS!!!! Add stitches????? Drop a few??????????? Yikes!!!! Okay, now I have to rethink this knitting thing! ROFLMAO!!!!!! beautiful scarves! i too am mostly a “square or rectangle” knitter. i did self teach myself to knit i-cord recently though. whoohoo look at me go! I’m proud of you for exercising. Right now I’m psyching myself up to do it, too. You are an inspiration….